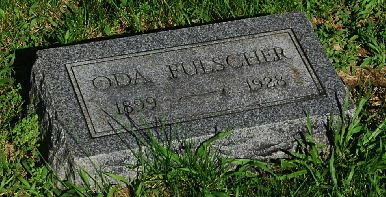 Oda (Bates) Fulscher gravestone in Lucas Chapel Cemetery. Oda Bates Fulscher, my great grand aunt, died on this day, September 7, in 1928 at the age of 29. According to her death certificate, she died of “Nephritis–Uremia.” Interestingly, her father had died of “Chronic Nephrides” [sic] just two years earlier. Oda was born August 31, 1899 in Logan County, IL, the daughter of Robert Josiah Bates and Marga Anna Radley. She was the youngest of their five children and was born several years after her next oldest sibling, my great-grandmother Floy, who was ten years old at Oda’s birth. Oda had given birth to her only child, Harold Fulscher, in 1927 so he was just shy of 15 months old at her death. Besides her son and his descendents, one of the ways her legacy has continued is through one of our family stories. Oda was only seven years old when her sister, Floy Bates Aderman, gave birth to her first son. Oda was insistent that Floy name the boy “Oda” and no matter how hard she tried, Floy was not able to convince the young girl that “Oda” was not a boy’s name. Then, loving her little sister as she did, Floy came up with the alternative–she named her son “Oscar Dearyl Aderman” so his initials would spell out “ODA.” Oscar honored that tradition again by naming his oldest son with the same initials.